Flat rate of $1,200 total for the 1 day for up to 10 students and an additional $50/student over 10 students. 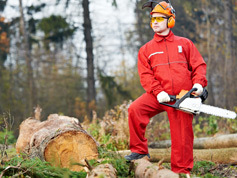 Course covers chain saw safety dealing mainly with slashing and bucking, and felling trees of all sizes. *Note: This course, only certifies felling trees under 6 inches Diameter Stump height. A full felling certificate is obtained through a different and longer course that we currently do not offer. Saw Maintenance and sharpening techniques. General Safety when using a chainsaw including fueling, carrying and starting a saw. Prevention of kickbacks, pull-outs and pull-ins. If available please bring PPE and a chain saw. If you do not have either, that is fine. Improve efficiency by proper maintenance of a chainsaw. Improve production though proper techniques and maintenance. Make sure companies have done all they can to ensure the safety of their workers. A ticket, providing certification of completing the course, that is good for three years. Tickets will be issued immediately on completion of course, with photo copies for the employers' records. Supervised or inspected felling operations used in logging, seismic hazard abatement, forest fire fighting, danger tree falling etc. No injury or time loss accidents of any crews supervised or inspected. 40 years' experience of operating a chain saw during course of duties, while working in the bush on and off. No injuries or accidents.